So the weather gods must have thought that our freak snow storm last month wasn't crazy enough for one year. On Tuesday the sky went suddenly black at about 1.30pm. Looking out my office window I was thinking to myself that this didn't look like an ordinary rain shower heading our way. 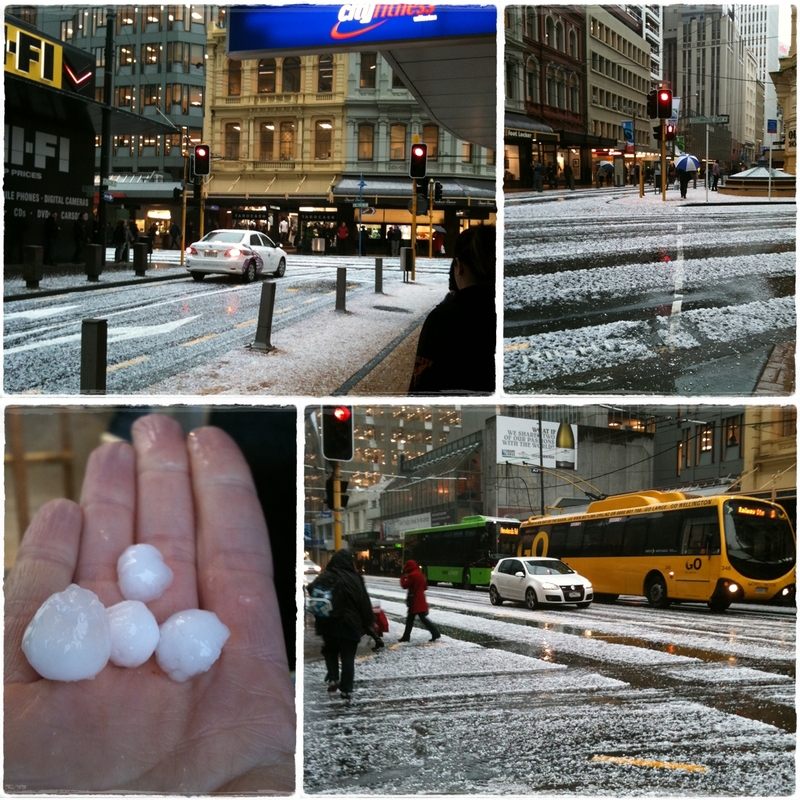 And sure enough, a couple of minutes later we had a hailstorm like nothing I've ever seen before. Hail the size of big marbles pelted the city for the better part of half an hour. I went down to the ground floor of our building to capture some pictures as the city was coated in an amazingly thick layer of hail, which settled far more than the snow ever did in the city. 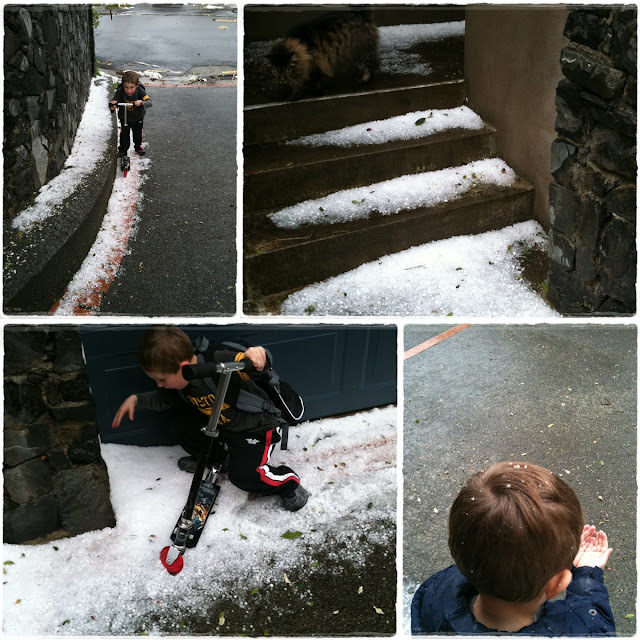 Noah loved riding his scooter through the hail on the way home from school and finding a few bits to chuck around and eat (despite me telling him it was a bit gross!). It's hard to put into words how much I love this band? But for me they have NEVER ONCE DISAPPOINTED. I've just listened to their new song Paradise launched this week and I can already tell it's gonna be my anthem of the summer. When I listen to Coldplay songs, particularly ones like Viva La Vida or Fix You or their most recent release Every Teardrop Is a Waterfall I get good gooseybumps and I never want the song to end, and it's just the same with this new song Paradise. Have a listen! Their new album titled Mylo Xyloto comes out on 24th October, and with a name like that how could it be anything but great!! Tee hee. This is a funky site that I found via How About Orange. I find it strangely therapeutic watching these beautiful colours weave their way across my computer screen. You know how some people have those little squishy balls they massage into their palms for stress relief? 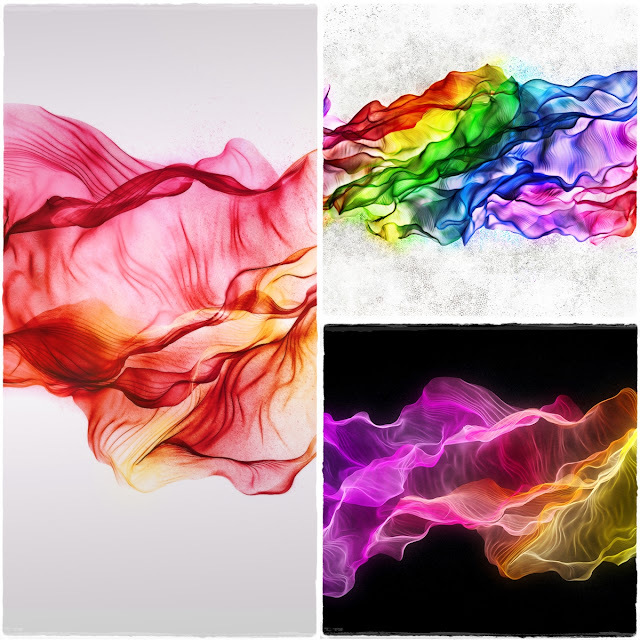 Me - I think I could just stare at these beautiful silky colours playing across my screen all day long. Give it a whirl, it's pretty darn cool. On the subject of cool sites, I have to thank Dee over at Dee*Construction for mentioning Starfall.com on a Facebook status update, and curiosity got the better of me so I had to find out more. Needless to say, with the stage that Noah is at right now with his reading skills coming on daily, it is absolutely PERFECT for a bit of extra reading fun. It also makes a good distraction from the inevitable 'Can I watch Star Wars?' which we get every.single.weekend. at the moment! 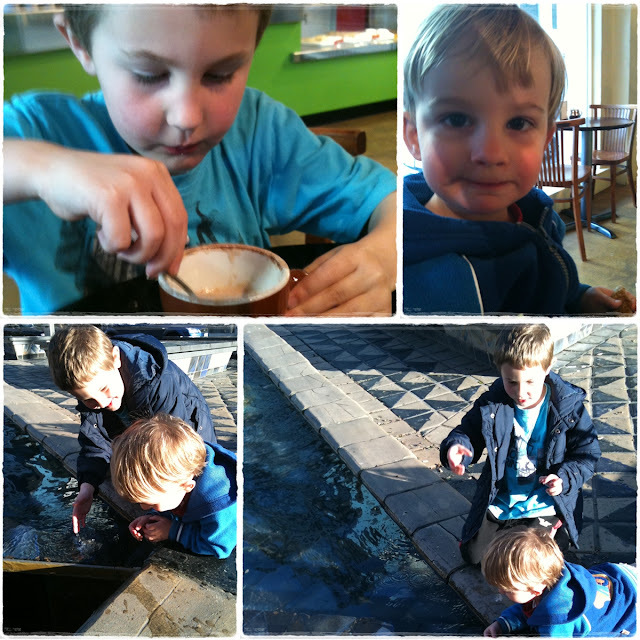 Have I mentioned how much I am loving my afternoons with the boys? As well as heading to town so Noah could Give it a Try Monday, on Wednesday we also enjoyed a trip to Wholly Bagels to claim a free bagel and hot chocolate, combined with a trip to the library where we read some books together before leaving with DVDs - Tractor Tom for Mylo and Land Before Time for Noah. While at the library we also discovered a rather interesting book called 'Milo and the Magical Stones' And yes, you could be forgiven for thinking we have Milo/Mylo on the brain this week?! But it was truly a coincidence we found this set of books about Milo the mouse. What is really unusual is that half way through the books they split into 2 endings, a happy ending and a sad ending. Unusual for a kids picture book, no?! 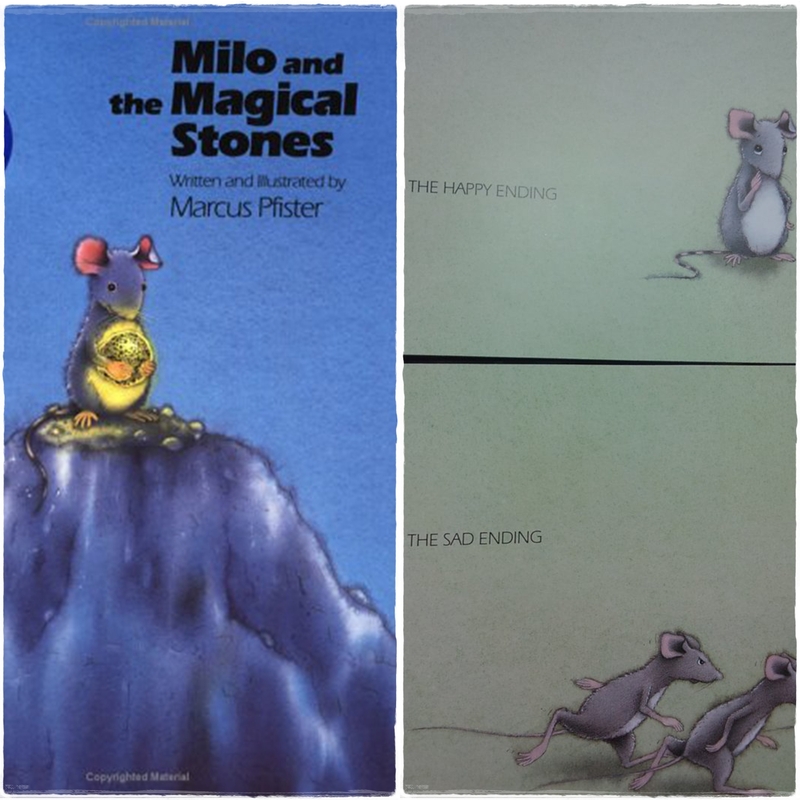 The book starts with Milo discovering a magical stone underground on their island that emanates light and warmth. So all the other mice decide they want one too. The wise old mouse says that if they take a magical stone they should give something back to their island in return for the gift of the stones. It is here that the book splits in two. In the happy ending....the mice all find a plain rock and carve or create a beautiful work of art with their rocks which they then carry deep into the mountain and leave in place of the glowing stones they have taken. From then on the winter does not bother them so much as they all have a special light in their cave to keep them warm and bright over the winter. Every year they celebrate the beginning of winter by taking their magical stones on a parade along the cliffs as a tribute to their beautiful island. In the sad ending....the mice ignore the warning and instead of taking just one magical stone each, they fight to find the best and biggest stones, taking more and more stones out from the mountain. Poor Milo watches his friends sadly worrying about what will happen, as he is the only one who wants to make a gift to give back to the island. As the mice are consumed with more and more greed, they dig deeper and deeper into the mountain to find more stones, until the mountain gets hollowed out completely and it collapses on top of all the mice. Milo and his wise mouse friend are the only mice left. 'The stones could have brought such happiness' they say sadly whilst working on the gift Milo has chosen to give back to the island. A lot of very interesting messages in each ending about environmental and social responsibility, which is quite ambitious for a kid's book but I think in a strange way it kinda works?! Mark has just managed to secure two relatively cheap (by World Cup standards anyway) tickets to the South Africa v Fiji game so Noah will be able to attend his first ever World Cup rugby game tomorrow night with me tagging along for the ride. I think he would probably have preferred to go with Daddy but as Mark is heading up to the Naki to watch the Wales v Namibia game with my uncle and cousins in a week's time, he is being a super gentleman and allowing me the chance to go to a World Cup game too. Thanks hon! I am also loving that we are embracing both sides of our boys' heritage during the RWC! Although....not entirely sure what is going with that crazy expression on Mylo's face? Perhaps he's a bit miffed that he had to wear England while his big brother got to wear the All Black shirt, ha ha! 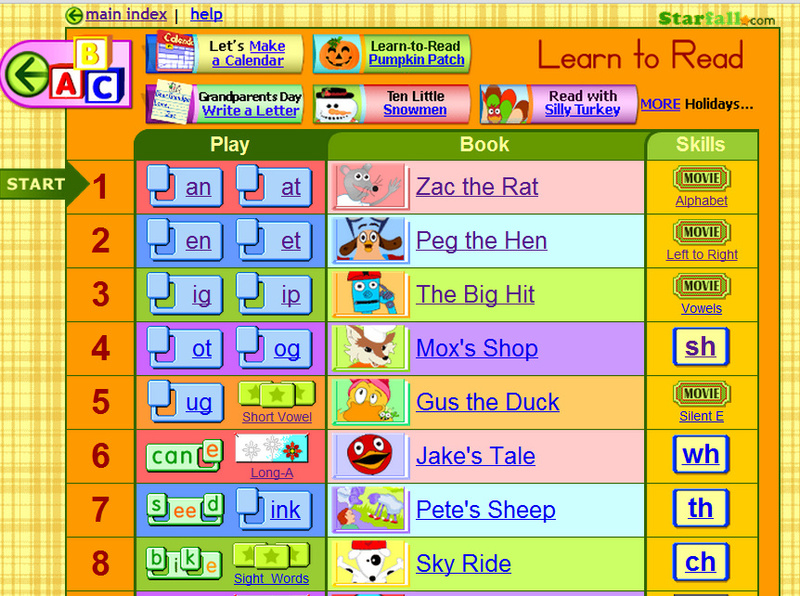 ANother cool reading site which my kids have been using at school is Reading Eggs.com. Even Joe loves it. They have insentives to get through the stages, getting tokens for a virtual house. My cousin posted something on FB about that hailstorm - crazy! Love the pic of your boys dressed up for the RWC. And Starfall is definitely a winner - Bean loves it! That hail is insane! Those silky colours are super soothing - definitely take those over a squishy ball any day! Woah - I don't think I've ever seen hail so big... and so much of it!! Your boys are so cute!! off to check out Silk! Oh I miss Wholly Bagel! The boys look cute in their rugby gear! Hope you guys have fun at the World Cup. I so don't get Rugby Union (please don't stone me!) The rules confuse me no end. Wow that hail is crazy! I absolutely love that coldplay song. I always enjoy reading your loving posts Meghan. I'm going to check out both the new coldplay album (we are so not up-to-date with what's new out there!!) and that starfall.com too. will be good to have as an extra activity! Lots of great pics and things to love. Those swirly whirly graphic images are cool! And I love Coldplay too. Glad you're enjoying your extra time with your gorgeous boys and yes, Starfall is awesome. I have come across quite a few useful education sites since home-schooling Sophie - I was putting them up on my 'Many Paths to Learning' blog, but have trashed that blog now (no time to update!) - I'll add the educational links to my main blog for easy reference.